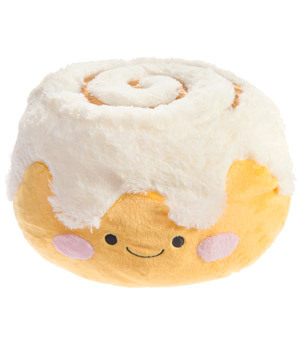 Comfort Food Squishables: Huge huggable toys modeled after tasty treats. 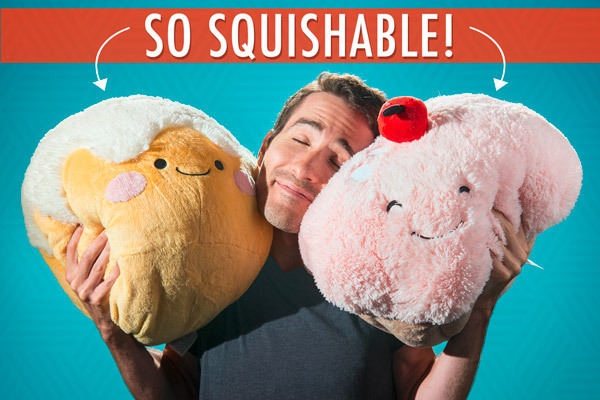 Pay homage to the deliciousness of a sweet treat with the gloriously large and cozy Comfort Food Squishables. These adorable stuffed "animals" have a super soft texture and large, plush bodies. After extensive testing, we’ve determined that they’re the ideal shape and size for hugging. And their cheery smile lets you know that they enjoy it just as much as you! We recommend keeping them on your couch or bed as darling decorations and super snugglers. Have you ever enjoyed a food so much that you wanted to hug it? 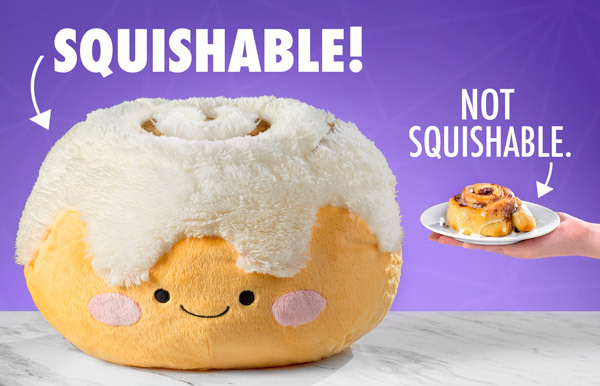 Now you can wrap your arms around a giant Comfort Food Squishables and give your favorite dessert the love it deserves. Each giant snuggly snack has a luxuriously soft plush surface that’s addictive to touch and an overstuffed body that’s begging to be hugged. Cozy up with these soft treats for a moment of heartwarming solace or prop your head on the plump pillowy body when you need to relax. Curl up with your favorite dessert. Whether you’re embracing an oversized dessert or a more traditional stuffed animal, a proper hug is something you can throw both of your arms around. 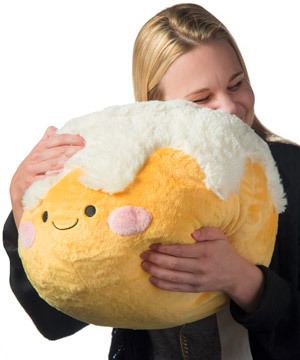 Comfort Food Squishables are a robust 15 inches in diameter, so you have plenty of plush to squeeze. 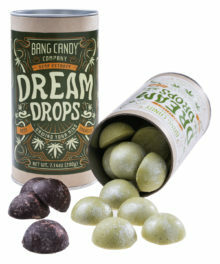 Their large size makes them superb snugglers at the end of a long day or anytime you need a cute pick-me-up. 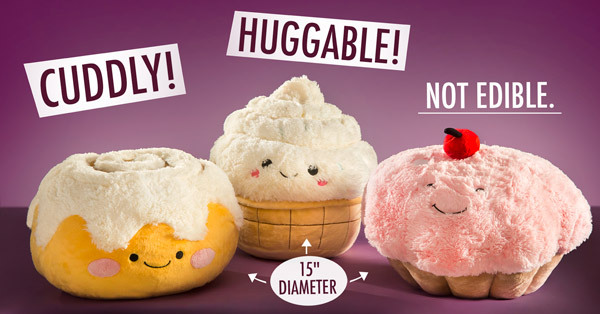 Comfort Food Squishables are available in three styles: cinnamon bun, soft serve cone, and cupcake. Each variety is designed to look like an adorable version of a classic comfort food complete with a delightful grin and smiling eyes. 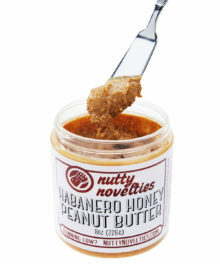 Pick up your favorite food and squish, squeeze, and squeal in delight. 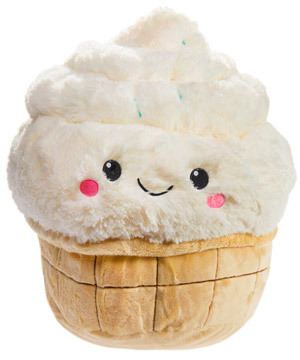 Grab a pillowy pastry or a cuddly cone. 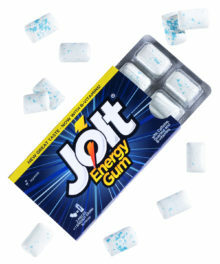 Question: Do they taste or smell like food? Answer: Comfort Food Squishables resemble food in appearance only. Unless you have a hankering for polyester, we don’t recommend taking a bite out of them. 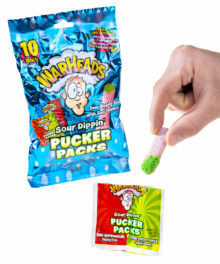 Question: Are these OK for children? 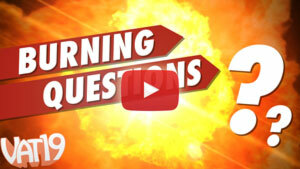 Answer: Comfort Food Squishables are intended for children ages three and up.